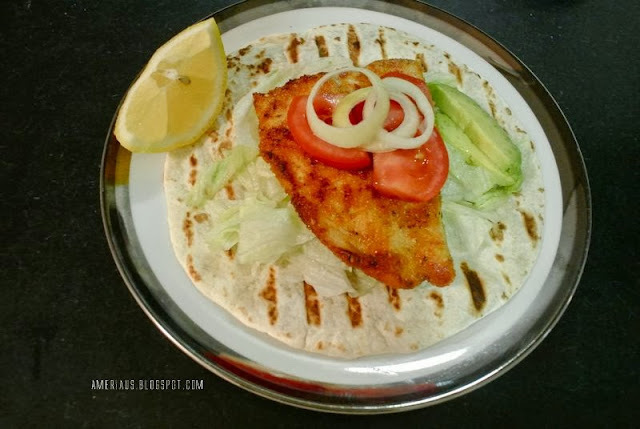 I can't believe I haven't done a fish taco recipe on the blog yet?! It's one of our favorite meals. Well not this time ladies and gents! I tried something a bit different with this batch of fish tacos to give them an extra kick! That kick was taco seasoning. It turned out so delicious we fell in love all over again...and taco seasoning will definitely stay stocked in our pantry from now on. Get your breading station together, first. Crack an egg in a bowl and lightly beat it. 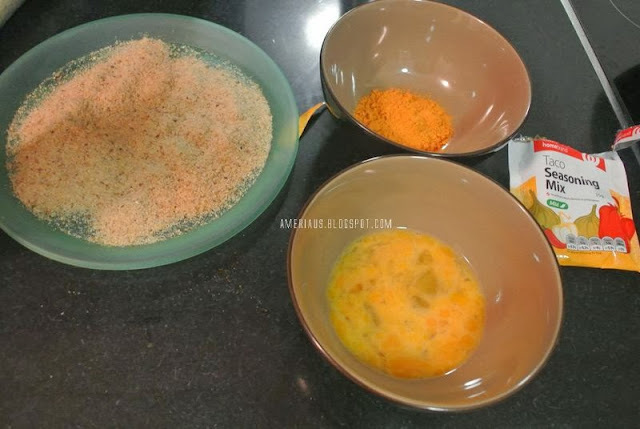 Place your taco seasoning in another bowl. Then spread your breadcrumbs out on a plate. 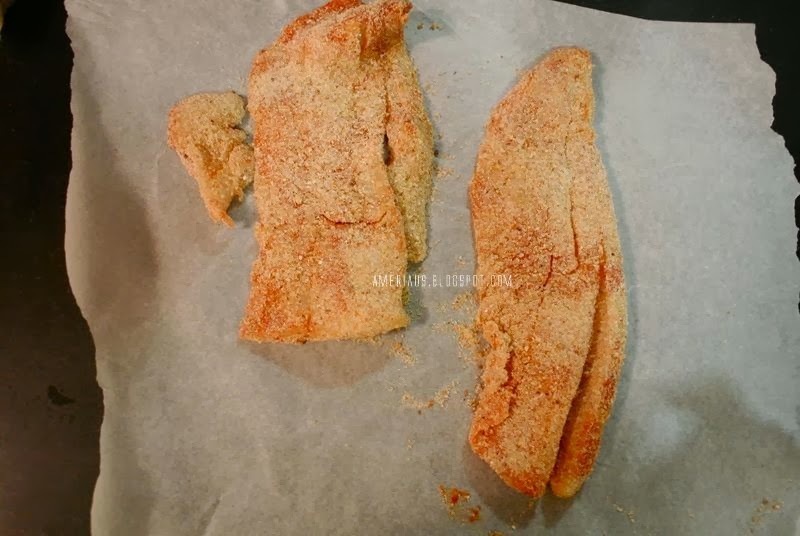 Take your fish fillet and dip it into the egg, then coat it in the taco seasoning, and finally cover both sides completely with breadcrumbs. 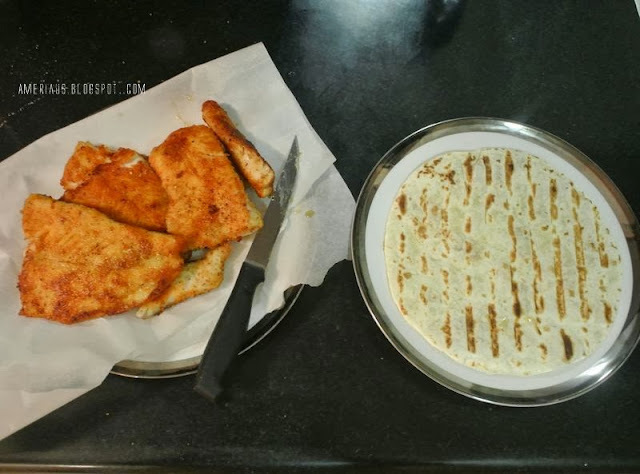 In a skillet with a light layer of oil fry both sides of your fish until cooked through and golden brown. Take a tortilla and grill it until warm and a nice set of grill marks appear. Tip: Instead of going outdoors and cranking up the BBQ for a few tortillas utilize your George Foreman or whatever equivalent you have. That's what I used! 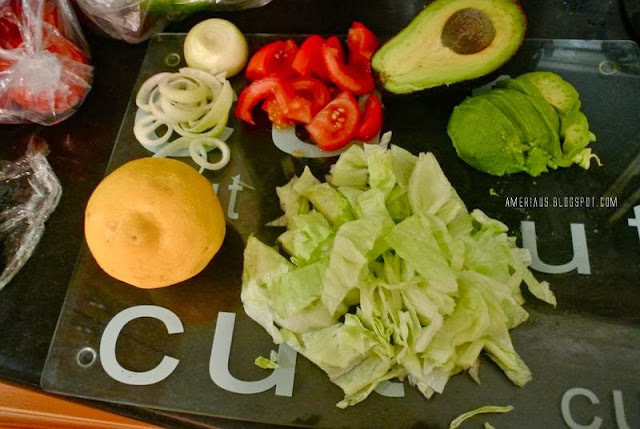 Create a bed of lettuce on top of the tortilla. Then place your fish on top, then tomato, onion and avocado! Lime or lemon to serve. Enjoy! An enjoyable eating experience does not come down to simply the taste. The atmosphere can make or break a meal. We like to indulge in a nice drink, good tunes, or even an entertaining film while we eat... In that spirit we are going to provide our own drink, music, and movie suggestions for our readers! As always we are very open to suggestions :) So feel more than free to share your opinions in the comment section. I love hearing from you!